Honey bees have very similar nutritional requirements to humans; they need proteins, carbohydrates, minerals, fats, vitamins, and water. 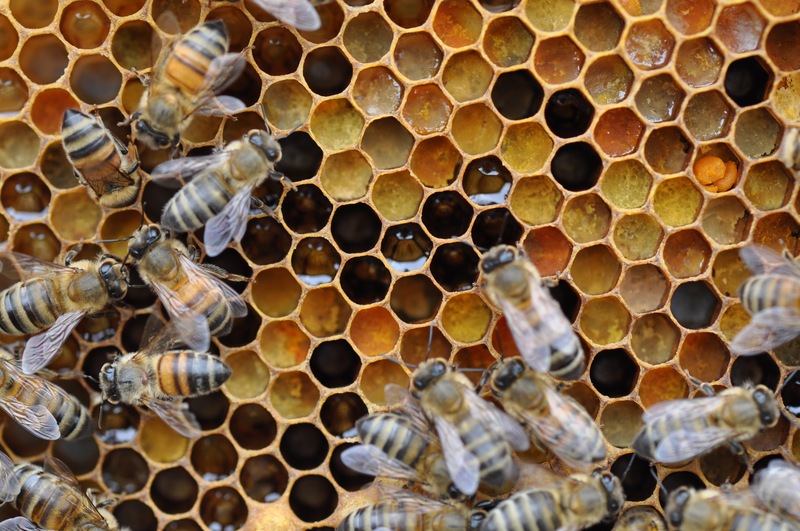 Honey bees collect nectar, pollen, and water in order to meet these nutritional requirements. Nectar and pollen are provided by the flowers that honey bees visit and pollinate. Nectar, which the hive will eventually turn into honey, is their primary source of carbohydrates, but also an important source of calcium, copper, potassium, magnesium, and sodium. The flower source determines how much of these minerals are available to the bee, if at all. Pollen is usually consumed by the bees in the form of “bee bread”. Bee bread is a mixture of pollen and nectar, or honey, and bee saliva and glandular secretions, which is stored in the hive for later use. It is the primary source of protein for the bees, but is also an important source of fats, minerals, and vitamins. It is important to note that the nutritional value of the pollen varies depending upon the flower from which it came. Some types of pollen are more nutritious than others. Honey bee workers typically choose pollen based on the odor and the physical structure of the pollen rather than nutritional value. A single honey bee can carry a pollen load that is 35% of its own weight back to its hive. At any given time, 15-30% of a colony’s foragers are actively collecting pollen, with Winter being the exception. Bees carry the pollen they collect on their hind legs, or structures called corbicula, or “pollen baskets”. After the worker bee has been out collecting, and has her plunder tucked into her pollen baskets, she will return to the hive where the pollen is conditioned by adding glandular secretions. These secretions contain enzymes which prevent harmful bacterial activity. The pollen, now referred to as “bee bread” is then stored in the hive for a few short months as a surplus. It is important to keep a source of pollen close to the bees, because they do not keep their stored bee bread for long. If the hive lacks the pollen sources it needs, the bees will have to live off of the small amount of stored pollen they have and their own body reserves. The hive will quickly decline in these conditions. When identifying the pollen that comes from a hive, it is evident that the hive is suffering when wind or water dispersed pollen is found. For example, pine trees have pollen which is wind dispersed, but bees living in a pollen desert will attempt to collect and retrieve nutrition of pine pollen. The best way to ensure that the hives are getting the proper amount of pollen needed for survival and brood growth is to become familiar with the native plants of the area, and the plants that provide the most nutrition to the bees. Planting these flowers close to hives will help to provide a great source of protein, carbohydrates, and minerals to the bees. “Honey Bee Nutrition” (Mid-Atlantic Apicultural Research and Extension Consortium) February 2015.